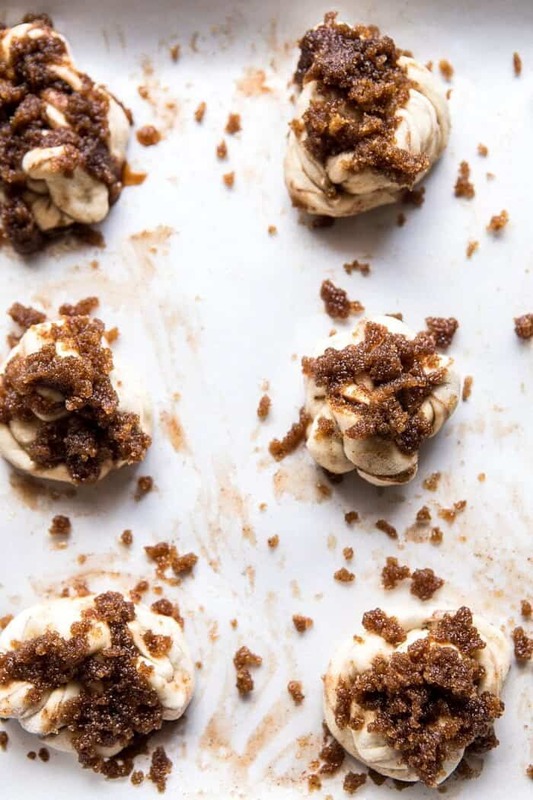 Easiest Cinnamon Crunch Knots for Easter weekend…and every other weekend after. 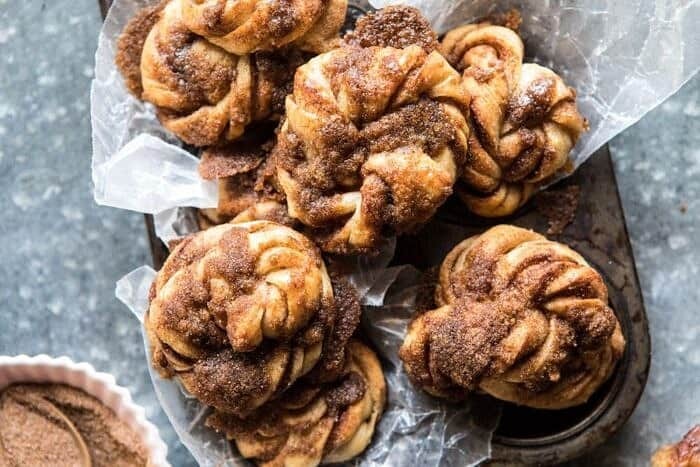 Easiest Cinnamon Crunch Knots for Easter from Half Baked Harvest on Vimeo. Hey, hi and happiest Friday! Can you guys believe it’s Easter weekend? It really snuck up on me this year and since it has been snowing all week long (ugh, I wish I was joking) it doesn’t really feel like Easter all that much. Hoping the snow clears for a sunny weekend, but either way I’m excited to hang with my family, film new recipe videos, and hopefully find some Malley’s Easter bunnies in Asher’s Easter basket (because Malley’s is the best…Ohio people you know what I’m talking about). In other very random news, my favorite vegan, legit personal stylist, HBH’s social media manager, who is also known as my brother Kai’s girlfriend Caitlin, is turning twenty-one tomorrow! For those of you above the age of twenty-one, who remembers their twenty-first birthday? It’s kind of a big one, but you guys, I seriously cannot remember what I did for my twenty-first. I believe I’ve mentioned this before, but my birthday has never been something I have looked forward to. Ever since I hit my teens it’s been something I dreaded instead of looked forward to. I know, I am so weird, but I am just not big on having all the attention on me, which I realize doesn’t really make sense considering what I do for a career. Anyway, I can’t remember what I did on my twenty-first. Kind of lame huh? What did you guys do? Also, let’s all wish Cait a very happy birthday because she’s totally going to be reading the comments! Double also, I should probably make her a vegan and sugar-free birthday cake, huh? Hmm, that could be tricky, but thinking I should at least try, would anyone else be interested in a cake like this? OK. Moving right along now. 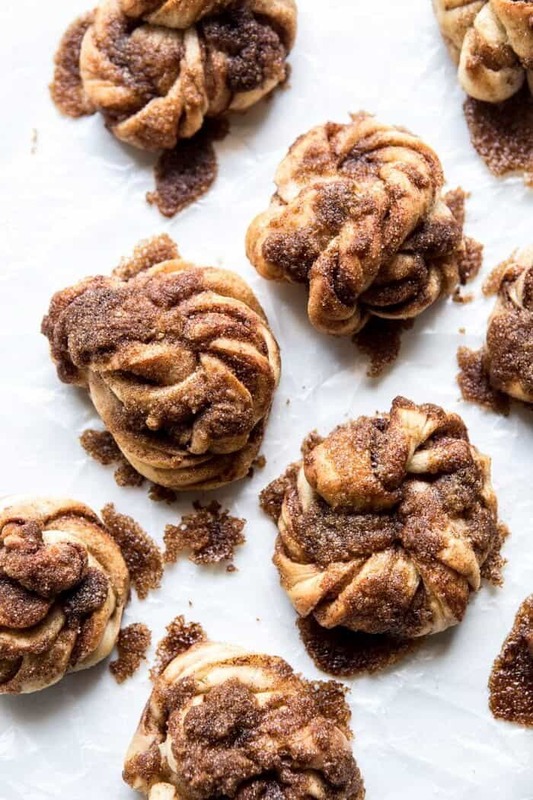 Let’s talk about these cinnamon crunch knots, which are in no way vegan or sugar-free (sorry Cait). I put out a note on Instagram stories this week asking you all what recipes you’d like to see. The overwhelming response was quick, simple, easy, minimal ingredients, and healthy…ish recipes. The good news for me (and you!) 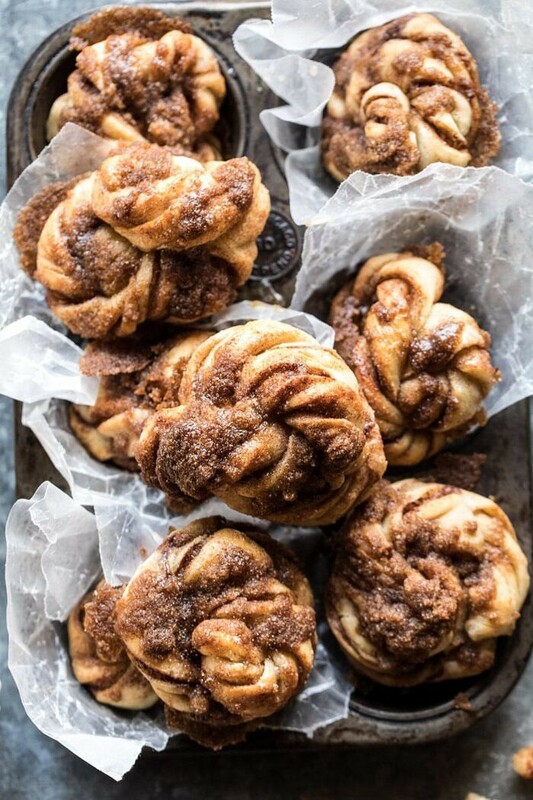 is that I kind of already knew this is what you guys wanted, which is why I am sharing these cinnamon knots today. 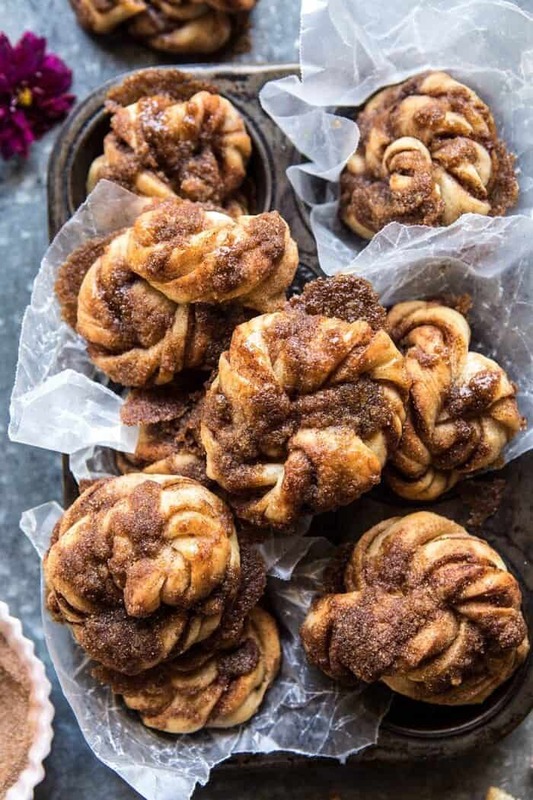 I wanted to leave you with an easy option for Easter brunching and snacking, and these cinnamon knots are that recipe. They require only pantry staple ingredients and can be made and ready to go in under and hour. Here’s how these fun knots work. The dough is actually something you might be surprised by, but I promise it works. We are using pizza dough to make these knots. Yes, pizza dough! Homemade, quick and simple pizza dough, that is so easy. I’m talking easier than heading to the store and picking up some pre-made dough. All you need is flour, water, honey, and instant yeast. Just mix, let sit for a bit, and you’re ready to make your knots. What I love about making these knots is that they are knots. Meaning, the more imperfect they are the better, so don’t stress about how they look. Trust me, once they bake up they will be delicious, and pretty, because cinnamon sugar has that effect on everything. The key to these knots? That crunchy, cinnamon, sugar topping. Have you guys ever had the Panera Cinnamon Crunch Bagels? They used to be my favorite (no Paneras up here), and their crunchy topping inspired the topping on these knots. 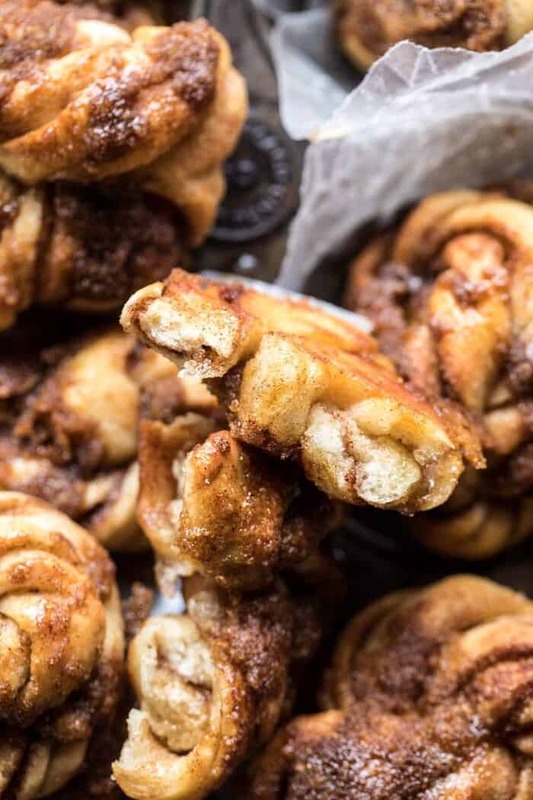 You guys, the topping takes these cinnamon knots to another level. SO delicious. And guys? That’s it. So simple, but so, so, so good. There’s not a person in the world that would not like these (well, there may be people who wouldn’t eat these, but everyone would like these). I mean, they’re just such a classic pairing that truly can do no wrong, you know? Make these for Easter this week, but be sure to keep the recipe in your back pocket to liven up your weekends ahead! 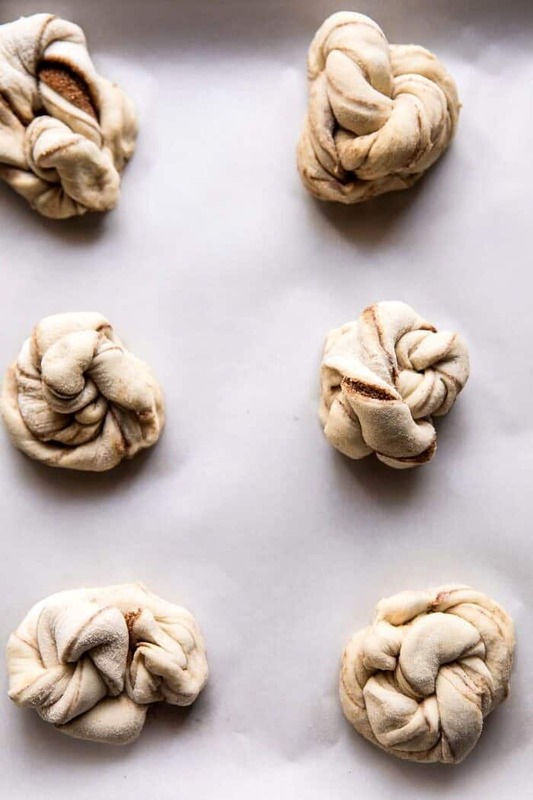 These knots require only pantry staple ingredients and can be made and ready to go in under and hour. 1. In the bowl of a stand mixer fitted with the dough hook, combine the water, yeast, honey, flour, salt, and olive oil. Knead until the dough comes together, about 1-2 minutes. Cover and let sit in a warm place for 30 minutes to 1 hour. 2. Preheat the oven to 375 degrees F. Line a baking sheet with parchment paper. 3. In a bowl, combine the granulated sugar and 1 teaspoon cinnamon. 4. On a floured surface, roll the dough out into a rectangle about 1/4 inch thick, adding flour to the dough if it is sticky. Spread the dough with 4 tablespoons butter and sprinkle with cinnamon sugar. Fold the dough in half and cut into 12 strips. Twist each strip and then tie into a loose knot, it doesn't need to be perfect. Place on the prepared baking sheet. 5. Melt the remaining 2 tablespoons butter. Stir the melted butter together with the remaining 1 teaspoon cinnamon and the brown sugar. Spoon clumps of the brown sugar mix over the knots (see above photo). This is going to be your "crunch" layer. Transfer to the oven and bake for 15-18 minutes or until golden. 6. Meanwhile, make the Glaze. In a medium bowl, beat together the powdered sugar, cream cheese, vanilla, and 2 tablespoons water until smooth and combined. If needed, thin the glaze by adding water, 1 tablespoon at a time, until desired consistency is reached. 7. Drizzle glaze over the knots, if desired. Enjoy! 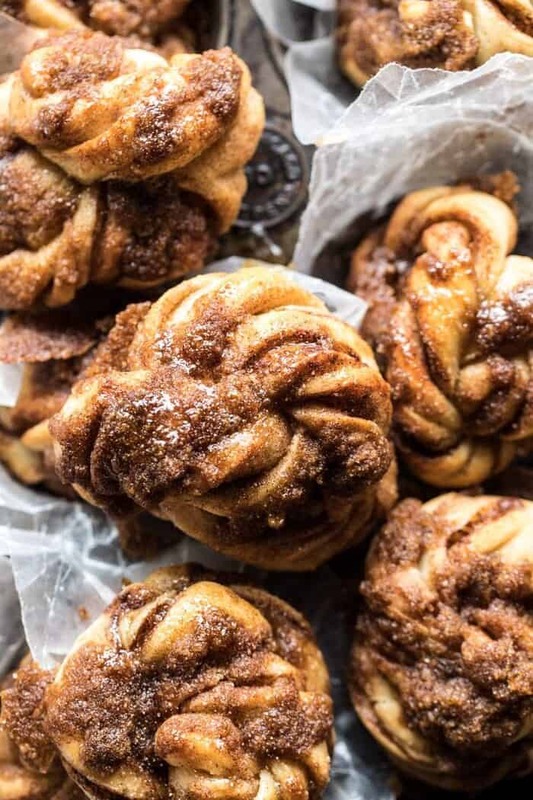 The most perfect, imperfect cinnamon knot. PS. see you guys tomorrow for a new Easter cocktail! Strawberry Coconut Carrot Cake with Mascarpone Buttercream. 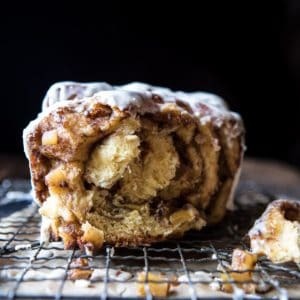 Maple Glazed Apple Pull-Apart Bread. 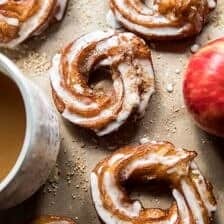 Mulled Apple Cider Chai French Crullers. 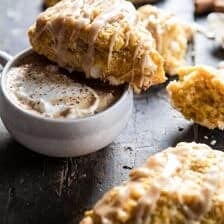 White Chocolate Pumpkin Scones with Espresso Glaze. Apple Cinnamon Rolls with Cream Cheese Chai Frosting. Hi! This may be a dumb question but any suggestions on mixing instructions if we don’t have a stand mixer/dough hook? Ohh these sound delicious Tieghan! I’m basically exactly the same wrt my birthday. I hate it! I actually removed it from FB too so my friends wouldn’t annoy me all the time haha. But I hope you have a wonderful birthday Caitlin!! Haha that is so something I would do! I hope you have a great Easter Emma! I am salivating like mad just at the thought of these!! must try soon! hey girl- these look amazing! Happy Birthday Cait! Y’all have a great Easter! Thank you Shawnna! I hope you have a great Easter as well! Happy 21st, Caitlin! Enjoy your special day! These look outstanding and as much as I hate rolling out dough, I’ve got to try them. Thank you Barb! I hope you love these! I don’t usually eat vegan and sugar-free but would be interested in a cake from you because I trust it would be good! Happy birthday to Cait. Wishing her a special day with those she loves. Totally agree on Malleys, met a friend in Ohio last weekend to grab my stash. It isn’t Easter without their bunnies. And my boys insist on Malley Ohs. Agreed!! I hope you love this recipe Kathy! Thanks! A vegan cake means no eggs which I am allergic to. And sugar is something I try to avoid, and not feed to the kiddos. So I am interested to see what you can offer for a vegan and low sugar cake! Thanks. It would be perfect for you then Deb! Thanks! I have the same question as Kristin….. No stand mixer. Any suggestions? These look yummy! May try with GF flour for Easter for a treat for my GF friends. Happy 21st, Caitlin! Have a blast! Thank you Christin! I hope you love these! Let me know how they turn out for you! YUM. Can’t wait to try these out this weekend! I noticed in the pics it looks like you used a muffin tin vs baking sheet, does that help the knots retain their shape? Also, if you do end up making a vegan/sugar-free cake for Caitlin (Happy 21st! ), I’d love to know how it turned out and/or the recipe. My mom is vegan and her birthday is this week, would be awesome to surprise her with a vegan cake! Oh wow how perfect! Thank you so much Katrijn, I hope you love these cinnamon crunch knots! you’re speaking straight to my cinnamon toast crunch loving heart. YES! I am so glad you are liking this recipe Aimee! A vegan, sugar-free cake sounds interesting! I think so too! Thanks Jackie! I love these knots and hope Caitlin has a lovely birthday tomorrow!! A vegan cake would be nice. 🙂 I saw a vegan cheesecake on minimalistbaker.com that looked good. Maybe vegan brunch spread? Haha I’m also turning 21 this year (June 28th) and will be in CA! But I’m not sure what I’m doing yet. 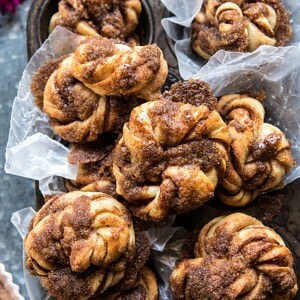 These cinnamon knots would be a nice brunch for Mother’s Day! Cinnamon sugar does do wonders. Awh that is so exciting that you will be 21! I hope you love these cinnamon crunch knots Kristin! I can’t wait to try making these! You should make a video for this one because I feel like this is kind of a tough one to visualize just from the instructions. You are a freaking goddess of the kitchen! Awh thank you Sarah!! I hope you love these! These are awesome! Everyone loved them… But I think the recipe is missing pieces. I bake so I knew that when the dough was super sticky, something was wrong. The recipe calls for 2 cups of sugar and more for kneading, but it never says to knead it after it comes from the mixer. It says it should be in the mixer about 1 to 2 minutes, of course every mixer is different so I had it in the mixer about 5. Then I let it rest and I kneaded it by hand till it was smooth and let it rest another 20 minutes. I rolled it out and it was a lovely dough. Then it was all good again until I mixed the brown sugar and cinnamon with the melted butter. It just became a liquid, but still I spooned it on and they had a nice crunch when done. I measure with a scale and checked my measurements twice. I will definitely make these again. They were easy to make and looked beautiful. Very impressive. I froze a few to see how well they freeze and reheat. But I had to sneak them away. They are dangerously delicious! Hi Marni! I am so glad you enjoyed this recipe so much! Thank you! Perfect treat for the week end ! Haha oh wow! That sounds so fun. Thank you Rain! Malley’s!!!! Yassss! The best hot fudge sauce ever! This Cleveland girl probably had the only Labrador named Malley in Seattle. Happy Easter to everyone at HBH. Thank you Maria! There hot fudge sauce is delicious! Happy Easter to you! Any additional feedback on these two items? I literally woke up this morning (I live in Ireland), saw these on Instagram and headed straight downstairs to make them! They turned out really good! Only issue I had was that the dough was suuuuper sticky. I literally couldn’t roll it out. So I added a good bit more flour and then I was able to roll it. Just wonder if I went wrong anywhere for it to be so sticky? These looks delish and this might be a crazy question, but when you roll out the dough, approximately what would the dimensions be? Can hardly wait to make them, but want to make sure I do it right. Thanks! I made these and had a problem. I decided to make them in paper muffin cups and they stuck to the paper. The brown sugar crumble melted everywhere and became like glue so the paper muffin cups don’t come off. Made these this morning, everyone loved them. Easy to make, and smelled so good while baking. Thank you for a recipe that made my family very happy! I had the same problem with the dough, it was just too sticky. Maybe my weather here in Pacific Palisades is too wet or something, I had to add quite a bit more of the flour. I used all purpose so perhaps you would use less of the whole wheat flour. I am still now waiting to see if this works. Love this recipe! 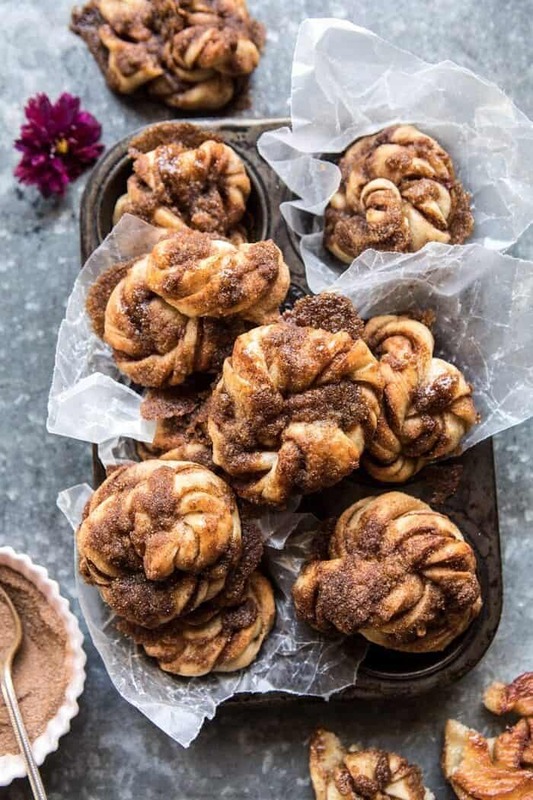 I had the same problem as another person with the brown sugar, butter cinnamon topping….it melted off of the buns during cooking and pooled on the pan. How did you avoid that? Did you add more topping after they came out of the oven? Thanks! These knots look incredible! 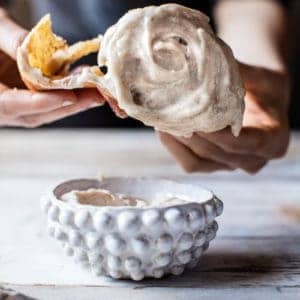 I was already hooked from the photos, but after you mentioned the Panera Cinnamon Crunch Bagels I am double-hooked and need to make these ASAP! Happy 21st to Cait! Thank you so much Lauren! I am so glad you love these! I am updating my comment to include the finished products. They came out just great and everyone loved them but I had to change the recipe a little. I am not sure why but I had to use 3 cups of all purpose flour. This came together great and was pretty easy to roll out. The crunch topping needed quite a bit more brown sugar to get that really great crunch, I think I doubled the sugar. Anyway, thanks so much, they were a real hit. Thank you Sandy! I am so glad these turned out amazing for you! Hi Danielle! I am so sorry that this happened to you! I hope they turn out amazing next time ! Can these be made the night before? I want to bring them to a brunch but probably won’t have time the morning of to make them. Thanks! I would love to see a vegan and sugar-free cake! Would the cake be free of all types of sugar, or would you just be using natural sweeteners (fruit, maple syrup, honey, agave, etc.)? Hi Annaliese! The cake would most likely be sweetened with fruit like dates and bananas! Still trying to create this haha! Thank you! Hello! I made these and they turned out delicious but I think I can do a bit better next time. I did fix the stickiness issue with adding approx. 2 additional tbls. of flour while kneading in the mixer. The dough was a dream to work with but when you say “fold in half”… is that the long way or the short way of the rectangle? I assume the long way but wanted to make sure. Also, would you let them raise a bit after forming into the knots prior to baking? I thought this may make them a big puffier? Thank you! Congratulations to them! That is so exciting! I am so glad they loved this Karen, thank you! is it possible to make these the night before and leave in the fridge overnight? Hi! So I don’t have any instant yeast, but I do have active dry yeast. Will that work? Do I need to adjust anything if I’m using that? Is a packet of yeast 7 grams? How on Earth are these considered “total time: 30 minutes” when the dough needs to sit for 30 minutes to an hour? They look delicious, but I’d appreciate honesty in the prep notes. Hi Maggie, so sorry about that! I hope you love these! Do you put 2-2 1/2 cups flour? Making it a total of 5 cups or just 2 1/2? Can’t tell if that’s a typo? Duh! Disregard my earlier question! Glad you got it figured out! Thank you Patricia! Let me know if you have any other questions! I can see salty versions of these with some parmesan or other grated cheese! Thanks again. Love all you post! Thank you so much Christina!! I will go check it out! Thank you Miryam! If I want to make these the night before serving, where is the most sensible place to pause? Or should I just bake them all the way and warm the next morning? These are amazing! Made them this morning and couldn’t be more pleased! I am taking them to a work function and wont have time to bake in the morning. How would you recommend storing for best freshness? I have a frozen pizza dough ball in my freezer. Can I just defrost and use that instead of making from scratch? I love this recipe so much as previously stated because it introduced me to my dough hook. Wondering if you also use if for your pizza dough and if so, are their adjustments to your current recipe? Thanks!!! Hi there! Just checking, how many grams if yeast in your packet? I’m in Finlabd, so our size might be different to yours… Looks delicious!! I made these on Saturday. they were AMAZING!! I didnt even have time to take a picture because they were gone that quickly! Next time, I’ll definitely double the recipe! Thank you Kerry! I am so glad you loved this recipe and hope you continue to love others on my blog! The flour measurement is confusing me slightly. What’s the correct measures 2 or 2 1/2? I have active dry yeast packets. Will that work? I just made these this morning, and they were a hit with everyone! When I made the brown sugar mix, it had way too much butter and was soupy. So, I redid the mix to use less butter, and it turned out much better. Thanks so much for sharing! I will definitely be doing these again! I am so glad you loved this Brittany! Thank you so much! I know this is a recipe from a few months ago, but had to tell you that I made these yesterday and they turned out fabulous! The dough was so easy and nice to work with and rolled out beautifully. The dough rose up great in the 30 minutes too. Never had one issue! They were yummy! Thanks for this recipe. I am so glad you enjoyed this and they turned out amazing for you Colleen! Thank you! Are we able to prep this dough the night before and placing in the fridge? Or will it affect the flavor? Awesome recipe! My first successful recipe using yeast! Looking forward to making this again. I am so glad this turned out amazing for you Sarah! Thank you! Hi Isabel! Do you need the measurements in grams or ounces? Hi Tieghan, I love this recipe, I made it twice and it was a hit! Only problem though, the knots got kindda hard very fast, in a matter of hours, gone was the perfect softness and chewyness of the beginning, just like stale bread .. what would be the problem in the way I made them according to you ? Problem with the flour maybe ? (I used regular French floor which I think is different from the American one). Thanks a lot ! This recipe looks amazing!! My husband LOVES the cinnamon crunch bagels at Panera. They are literally the only bagels he even eats. When I saw this recipe, I knew I was going to make it for him. Thank you!! I will try to let you know how it goes. I love blessing him with baked goods so thank you for providing this recipe! I hope he loves these Sarah! Let me know how they turn out! Thank you Sarah! Can you substitute gluten free all purpose flour for this recipe? Looks delicious! Oh hell, Lady why do you tempt me with this evil? I say evil cause im diabetic…gonna have to try them anyway. Have you ever tried making them with splenda subistues? Hi Autumn! I am so glad you like this recipe! I have not tried it with splenda substitutes, so I am not sure how it would turn out.. If you do end up trying it, please let me know! I just made these, and they are seriously amazing! And so easy. I just made these for the second time and used 1/4 cup of whole wheat flour and the rest all-purpose. I also added some chopped pecans then put orange glaze on after they cooked. They came out wonderful. Thanks so much for this recipe! I made these and they are delicious! The only problem is the cream cheese in the glaze became tiny chunks that don’t look particularly appetizing. Any suggestions on how to make it uniformly smooth? I left it out for around 1.5 hours before mixing. Beyond simple to make yet they’re a total crowd pleaser! Made these on Easter morning for my boyfriend’s family (all very experienced pastry chefs) and they loved them. I swapped out Greek yogurt for the cream cheese in the icing (I like a sweet-tangy balance to the cinnamon-sugar). Another HBH hit!